The courts, the juries, and even judges were not behaving as usual. Juries were acquitting radicals: Angela Davis, black and an acknowledged communist, was acquitted by an all-white jury on the West Coast. Black Panthers, whom the government had tried in every way to malign and destroy, were freed by juries in several trials. A judge in western Massachusetts threw out a case against a young activist, Sam Lovejoy, who had toppled a 50-foot tower erected by a utility company trying to set up a nuclear plant. In Washington, D.C., in August 1973, a Superior Court judge refused to sentence six men charged with unlawful entry who had stepped from a White House tour line to protest against the bombing of Cambodia. Undoubtedly, much of this national mood of hostility to government and business came out of the Vietnam war, its 55,000 casualties, its moral shame, its exposure of government lies and atrocities. On top of this came the political disgrace of the Nixon administration in the scandals that came to be known by the one-word label “Watergate,” and which led to the historic resignation from the presidency—the first in American history—of Richard Nixon in August 1974. It began during the presidential campaign in June of 1972, when five burglars, carrying wiretapping and photo equipment, were caught in the act of breaking into the offices of the Democratic National Committee, in the Watergate apartment complex of Washington, D.C. One of the five, James McCord, Jr., worked for the Nixon campaign; he was “security” officer for the Committee to Re-elect the President (CREEP). Another of the five had an address hook in which was listed the name of E. Howard Hunt, and hunt’s address was listed as the White House. He was assistant to Charles Colson, who was special counsel to President Nixon. 1. Attorney General John Mitchell controlled a secret fund of $350,000 to $700,000—to be used against the Democratic party— for forging letters, leaking false news items to the press, stealing campaign files. 2. Gulf Oil Corporation, ITT (International Telephone and Telegraph), American Airlines, and other huge American corporations had made illegal contributions, running into millions of dollars, to the Nixon campaign. 3. In September of 1971, shortly after the New York Times printed Daniel Ellsherg’s copies of the top-secret Pentagon Papers, the administration planned and carried out—Howard Hunt and Gordon Liddy themselves doing it—the burglary of the office of Ellsberg’s psychiatrist, looking for Ellsberg’s records. 4. After the Watergate burglars were caught, Nixon secretly pledged to give them executive clemency if they were imprisoned, and suggested that up to a million dollars be given them to keep them. In fact, $450,000 was given to them, on Erlichman’s orders. 5. Nixon’s nominee for head of the FBI (J. Edgar Hoover had recently died), L. Patrick Gray, revealed that he had turned over the FBI records on its investigation of the Watergate burglary to Nixon’s legal assistant, John Dean, and that Attorney General Richard Kleindienst (Mitchell had just resigned, saying he wanted to pursue his private life) had ordered him not to discuss Watergate with the Senate Judiciary Committee. 6. Two former members of Nixon’s cabinet—John Mitchell and Maurice Stans—were charged with taking $250,000 from a financier named Robert Vesco in return for their help with a Securities and Exchange Commission investigation of Vesco’s activities. 7. It turned out that certain material had disappeared from FBI files— material from a series of illegal wiretaps ordered by Henry Kissinger, placed on the telephones of four journalists and thirteen government officials—and was in the White House safe of Nixon’s adviser John Erlichman. 8. One of the Watergate burglars, Bernard Barker, told the Senate committee that he had also been involved in a plan to physically attack Daniel Ellsberg while Ellsberg spoke at an anti-war rally in Washington. 9. A deputy director of the CIA testified that Haldeman and Ehrlichman told him it was Nixon’s wish that the CIA tell the FBI not to pursue its investigation beyond the Watergate burglary. 10. Almost by accident, a witness told the Senate committee that President Nixon had tapes of all personal conversations and phone conversations at the White House. Nixon at first refused to turn over the tapes, and when he finally did, they had been tampered with: eighteen and a half minutes of one tape had been erased. 11. In the midst of all this, Nixon’s Vice-President, Spiro Agnew, was indicted in Maryland for receiving bribes from Maryland contractors in return for political favours, and resigned from the vice-presidency in October 1973. Nixon appointed Congressman Gerald Ford to take Agnew’s place. 12. Over $10 million in government money had been used by Nixon on his private homes in San Clemente and Key Biscayne on grounds of “security,” and he had illegally taken—with the aid of a bit of forgery—a $576,000 tax deduction for some of his papers. 13. It was disclosed that for over a year in 1969—1970 the U.S. had engaged in a secret, massive bombing of Cambodia, which it kept from the American public and even from Congress. It was a swift and sudden fall. In the November 1972 presidential election, Nixon and Agnew had won 60 percent of the popular vote and carried every state except Massachusetts, defeating an anti-war candidate, Senator George McGovern. By June of 1973 a Gallup poll showed 67 percent of those polled thought Nixon was involved in the Watergate break-in or lied to cover up. By the autumn of 1973 eight different resolutions had been introduced in the House of Representatives for the impeachment of President Nixon. The following year a House committee drew up a bill of impeachment to present it to a full House. Nixon’s advisers told him it would pass the House by the required majority and then the Senate would vote the necessary two-thirds majority to remove him from office. On August 8, 1974, Nixon resigned. Six months before Nixon resigned, the business magazine Dun's Review reported a poll of three hundred corporation executives. 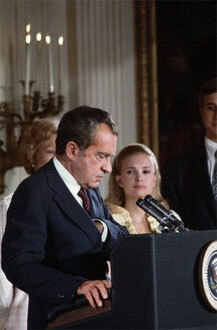 Almost all had voted for Nixon in 1972, but now a majority said he should resign. “Right now, 90% of Wall Street would cheer if Nixon resigns,” said a vice-president of Merrill Lynch Government Securities. When he did, there was relief in all sectors of the Establishment. Gerald Ford, taking Nixon’s office, said: “Our long national nightmare is over.” Newspapers, whether they had been for or against Nixon, liberal or conservative, celebrated the successful, peaceful culmination of the Watergate crisis. “The system is working,” said a long-time strong critic of the Vietnam war, New York Times columnist Anthony Lewis. The two journalists who had much to do with investigating and exposing Nixon, Carl Bernstein and Bob Woodward of the Washington Post, wrote that with Nixon’s departure, there might be “restoration.” All of this was in a mood of relief, of gratitude. In the charges brought by the House Committee on Impeachment against Nixon, it seemed clear that the committee did not want to emphasise those elements in his behaviour which were found in other Presidents and which might be repeated in the future. It stayed clear of Nixon’s dealings with powerful corporations; it did not mention the bombing of Cambodia. It concentrated on things peculiar to Nixon, not on fundamental policies continuous among American Presidents, at home and abroad. Indeed, the barrel was saved. Nixon's foreign policy remained. The government’s connections to corporate interests remained. Ford’s closest friends in Washington were corporate lobbyists. Alexander Haig, who had been one of Nixon’s closest advisers, who had helped in “processing” the tapes before turning them over to the public, and who gave the public misinformation about the tapes, was appointed by President Ford to be head of the armed forces of the North Atlantic Treaty Organisation (NATO). One of Ford’s first acts was to pardon Nixon, thus saving him from possible criminal proceedings and allowing him to retire with a huge pension in California. The televised Senate Committee hearings on Watergate stopped suddenly before the subject of corporate connections was reached. It was typical of the selective coverage of important events by the television industry: bizarre shenanigans like the Watergate burglary were given full treatment, while instances of ongoing practice—the My Lai massacre in Vietnam, the secret bombing of Cambodia, the work of the FBI and CIA— were given the most fleeting attention. Dirty tricks against the Socialist Workers Party, the Black Panthers and other radical groups, had to be searched for in a few newspapers. The whole nation heard the details of the quick break-in at the Watergate apartment; there was never a similar television hearing on the long-term break-in in Vietnam.